My New Year's resolution to pace myself a bit more has quickly gone down the pan - largely due to my inability to say 'no' to things. But it's difficult not to when there is always so much going on within the Faculty of Science: every week seems to bring new 'cv-enhancing' public engagement opportunities. And then there is my PhD to fit on top of it all! Needless to say, although the year is still young, I am already feeling run down - having a bad cold and losing my voice didn't help either! 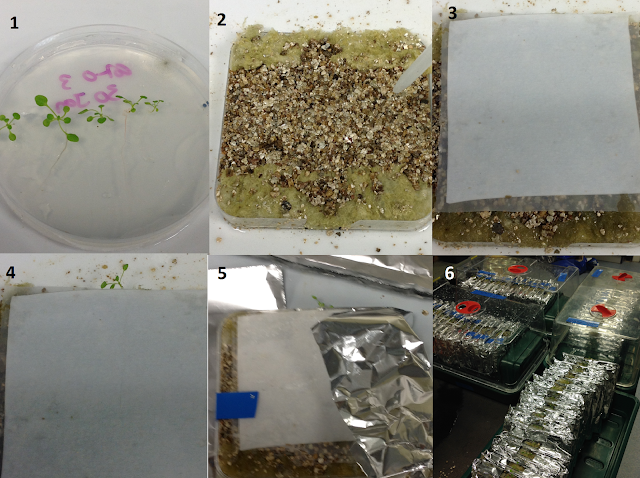 I've spent a lot of time underground this week, transplanting my Arabidopsis seedlings into rhizotrons: as I spend quite a few hours doing this, I made a basic diagram to illustrate the process. The seed is sterilised in the lab and germinated on petri dishes filled with agar to keep them safe from any bacterial or fungal nasties. When the roots are long enough (usually after 2 weeks), they are ready to transplant into my pre-made rhizotrons ('root observation chamber'). Essentially these are square petri dishes filled with a packing medium called vermiculite, with a hole at the bottom for drainage and one at the top for the seedling to poke through. After moistening the vermiculite with my trusty squirty bottle, I add a layer of mesh on top (to stop the seedling's roots growing into the vermiculite). The seedling is then carefully removed from the agar with tweezers and laid on top of the mesh. Finally, I tape the lid shut then wrap the whole thing in foil to keep the roots in darkness. In my growth cabinet, the rhizotrons are stacked vertically so that the roots grow downwards. When it is time to infect my seedlings, I simply peel back the foil, prise off the lid and apply the parasite seeds onto the roots. It's intricate work that demands concentration....so after transplanting 60 or so seedlings at a time I am typically done in! It doesn't help that the radio reception is so poor down in the annexe, making it quite a lonely task too. As for my 'other' work, outside the PhD....my main focus at the moment is the 24 hour Inspire event taking place on 30/31 March. This is a non-stop 24 hour series of lectures designed to enthral and entertain, whilst raising money for charity. As part of the publicity committee, I'm researching ways we can raise awareness - everything from having a stall in the student's union, parading around in animal costumes and appearing on local radio. The speaker programme for the Pint of Science Festival in May is also about to be announced, after which my work as social media secretary for this will really get underway. My aim is to make a series of short videos for Facebook and Twitter to promote the different talks and events. The trouble is, I haven't had much experience of video editing before so I duly attended some Creative Media Workshops this week hosted by the University's Computing Services Team. These proved a great way to boost my confidence and I managed to put together some pre-shot footage into a short film entitled "How to make a perfect cup of tea". Maybe not Speilberg standard but it's a start! The next step will be to borrow a camera and arrange some interviews with the Pint of Science speakers. All of which is quite enough to be getting on with...but I haven't even mentioned the Science and Engineering Festival coming up and the demonstrating work I have signed up for. I think I really must put a filter on my email inbox, so that I stop seeing all these opportunities.....ooh, look! A science communication essay competition! How could I not say 'no' to that....? I hope you have a good week and thanks for reading!